Last week we saw cozy cat hats grace the runway of Anna Sui's Fall 2011 fashion show in NYC, and the kitty craze has now gone global! Designers PPQ just debuted their fall line at London Fashion Week, with a pack of supermodels sporting fitted hats that are decidedly more Catwoman-cool, than Sui's more innocent and cutesy kitten-lady chic. Can we now say that cat hats are officially a trend? Elsewhere on the London catwalk, Topshop Unique showed off their latest line, jam-packed with..Dalmatian doggie prints!? Boo-hiss! However, feline fashionistas shouldn't despair, because a few cat related items made their way in too. 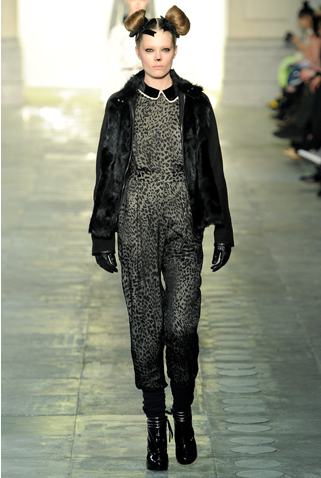 My favorite was this cheetah print jumpsuit, topped off with animal ear-esque hair buns, and an itty bitty kitty nose. Want to see more? Browse full slideshows from PPQ and Topshop Unique over at Style.com. Hmmm cute kitty nose...yep I like it! MOL! Are there Humans who would actually wear this stuff??? No matter how hard they try, they will never make it in the cat world!